Isolated Agile approaches don't guarantee organizational success. Ensure that your complex organization coordinates across all teams to deliver products that maximize business value. 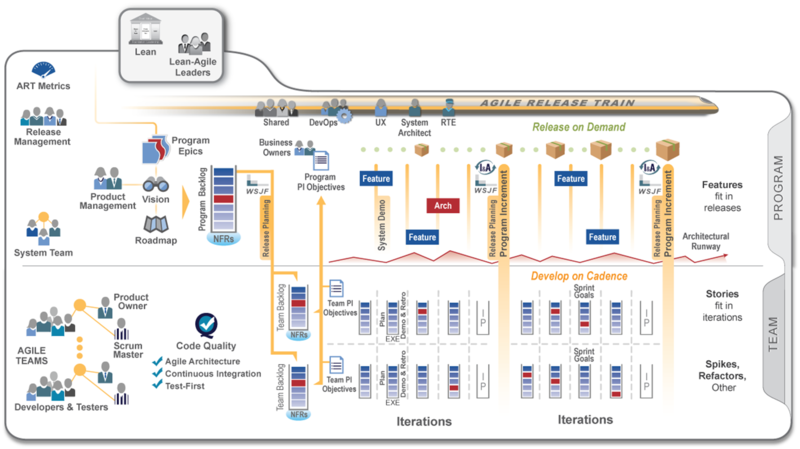 Scaled Agile Framework in the IBM Rational Collaborative Lifecycle Management Solution (CLM) can harness the success of Agile teams and apply lean thinking across your company. With Quick Planner, your teams can plan and track their work on mobile devices or on the cloud. This intuitive feature in IBM® Rational Team Concert™ makes team-based development fast and fluid. Some organizations are all Agile. Some have waterfall and Agile teams working side-by-side. Regardless of their method, you can bring your teams together. Reproduced with permission from © 2011-2016 Scaled Agile, Inc. All rights reserved. The SAFe features in Collaborative Lifecycle Management support lean thinking and portfolio management. Use the tools to effectively communicate business strategies, value, progress, and constraints so everyone knows what's important and why.